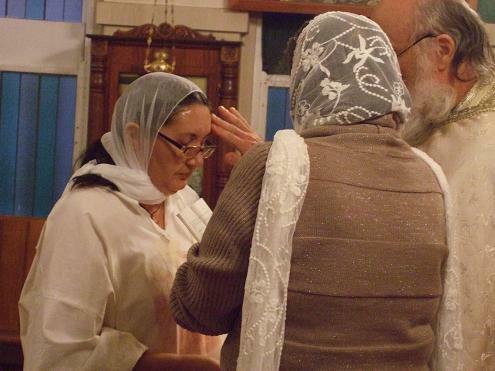 On the eve of Pentecost (Saturday 17/30 May), the servant of God Svetlana was baptised at the St Gregory Theologian Church in Bentleigh (Melbourne). A handful of faithful and guests attended the Baptism. 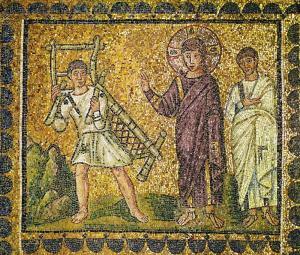 Renouncing Satan, expulsion of all evil, and the making of a catechumen. 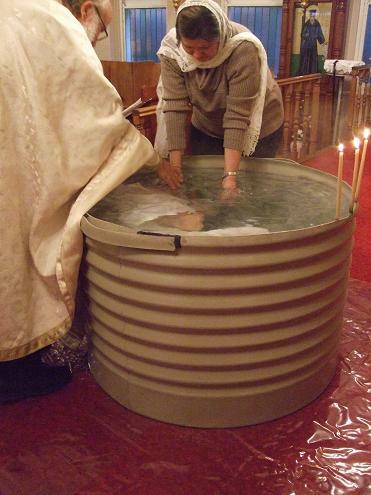 The servant of God is baptised in the name of the Father, the Son and the Holy Spirit. Amen. The old man dies to sin, and the new Christian rises to life in God. 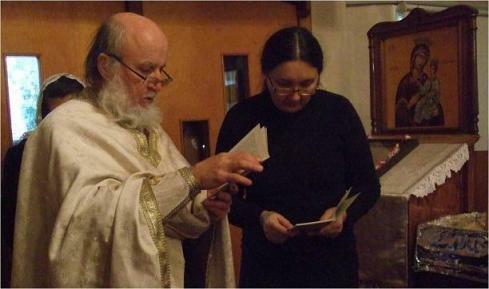 Newly-illumined Svetlana with her sponsor. 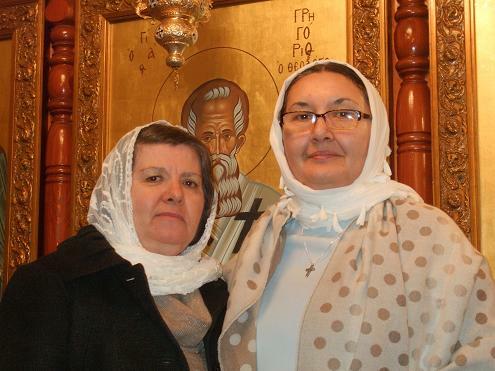 May Christ our God grant His newly illumined servant Svetlana health, salvation and many years! After the Baptism, Abbott John (ROCA) served Great Vespers in honour of the great feast, followed by a parish gathering in the hall. She makes mention of Him for Whom she waited and longed, but Whose presence was still concealed. She said, “I know that Messiah is coming, the One Who is called Christ. Whenever He should come, He will announce to us all things (John 4:25)”. Do you see how ready she was to believe that the Awaited One was already at hand, and how hopeful she was? Surely David’s words apply also to her: “Ready is my heart, O God, ready is my heart, I will sing and chant in my glory (Psalm 56:8). Christ makes clear the connection between moral life and coming to know God. 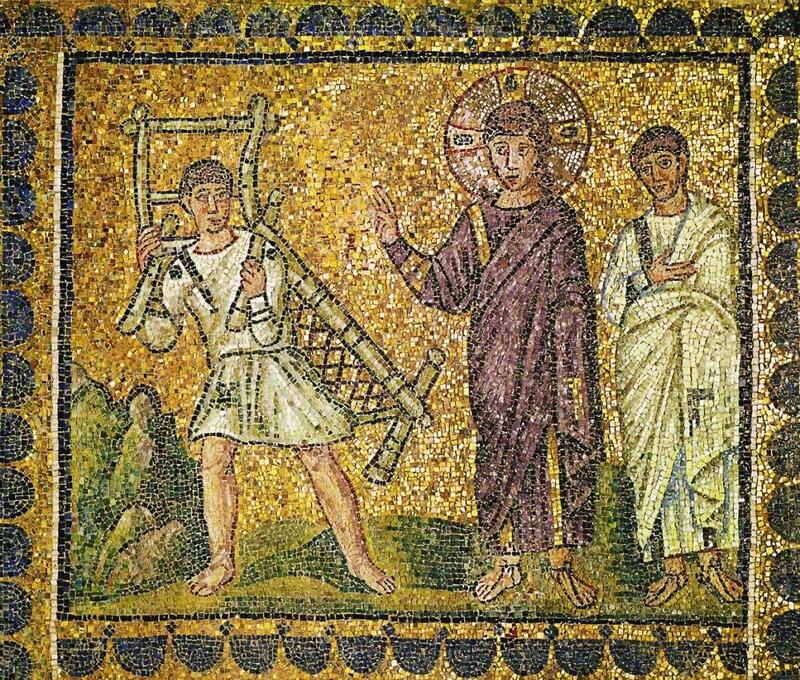 Only a person who makes himself ready to receive Christ, will be able to accept Him. God gives salvation, but we make ourselves ready by struggling against sin. O how great the wisdom of the woman! How meekly she receives the reproof! … She not only does not insult Him - as would the Jews - but even admires and is amazed, and supposes Him to be prophet. She is not indignant at the rebuke of her fault, but rather she is filled with astonishment. She was neither annoyed, nor insulted, nor took to her heels; but rather admired Him, and persevered the more…Note, that when she suspects Him to be a prophet, she asks Him nothing concerning this life, nor concerning bodily health, or possessions, or wealth, but at once concerning doctrines…Seest thou how much more elevated in mind she has become? 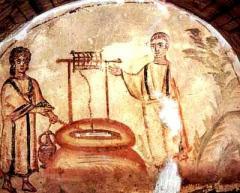 The Samaritan woman is saved from her many sins by Christ’s direct purification. Likewise, countless Christians are saved from the realm of the evil one by repentance and Baptism - regardless of their former sins. 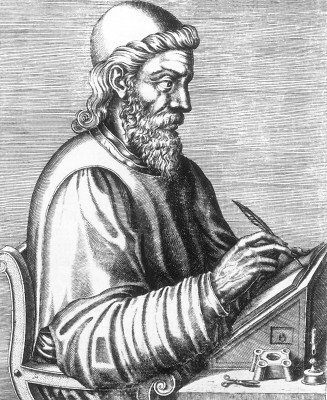 When God made this body of ours, He did not grant to it that it should have life either from His own nature or from the body itself, nor meat and drink, raiment and shoes; He appointed that it should have all the supplies of life from without, making the body in itself quite naked, and it is impossible for the body to live at all apart from the things outside itself, without food and drink and clothing. If it attempts to subsist upon its own nature alone, taking nothing from without, it wastes and perishes. In the same manner it is with the soul also. It has not the divine light, though it is created after the image of God. So has He ordered its conditions, and has been pleased that it should not have eternal life of its own nature; but of His Godhead, of His Spirit, of His light, it has spiritual meat and drink, and heavenly clothing, which are the soul’s life, the life indeed. But this was not the case after the Master Christ had come. The first man to go down into the pool of the waters of Baptism was not the only one to be cured. The first, the second, the tenth, the twentieth - all were cured. Even if you speak of ten thousand or twice or three times as many, if you speak of numbers without limit, if you put the whole world into the pool of waters, its grace is not diminished, it stays just as strong as it washes all those people clean. That is the great difference between the power of a servant and the authority of a master. The servant cured a single person; the Master cures the whole world. The servant cured a single person once a year. If you wish to put ten thousand in the pool daily, the Master returns them all to you sound and healthy. What was the spiritual meaning of this bodily healing? What does it teach us today? ‘Rise’ means shake off the sluggishness of the vices in which you have been ailing for a long time, and rouse yourself to the practise of virtues…’Rise’ by doing good works….’Take up thy bed’ means lovingly carry your neighbour, patiently tolerating his weaknesses, since he patiently put up with you for a long time when you were weighed down by the burden of temptations. ‘Keep on bearing one another’s burdens, and thus fill up the law of the Christ (Gal. 6:2) …So leave behind your earlier sins, and come to the aid of your brothers’ needs…. ‘Walk’ means to love God with your whole heart, soul, and strength, so that you may be worthy to reach the vision of Him. Go forward by making daily strides of good works from virtue to virtue. Do not desert your brother, …nor turn aside from the right direction of your path…In everything you do, see to it that you do not fix your mind upon this world, but that you hurry to see the face of your Redeemer. Bodily illness can have many different causes, but Christ’s words to the healed man “Sin no more” indicate that often they are caused by sin. Not all diseases proceed from sin, but the majority of them do from our manner of living. I mean from remissness or from immoderate indulgence of bodily appetites as well as laziness and inactivity produce such sufferings. But the one rule we have to observe is to bear every stroke thankfully; for they are sent because of our sins;…they are sent also to make us approved. The fathers teach us that bodily illness is not something we should sorrow over. It is a spiritual treatment given by God to heal us from sin, purify us from stains, and give us an opportunity to imitate the holy Martyrs. We shuld not dread any human ill - neither poverty, nor disease, nor insult, nor malicious treatment, nor humiliation, nor death - save sin alone. The sin of the first-created ones is willful turning away from God toward oneself. In this way we set ourselves in the place of God, actually worshiping self instead of the Creator. In this way the suffering of illness serves the same purpose today as it did in the beginning: For this reason it is a sing of God’s mercy and love. As the holy fathers say to those who are ailing, ‘God has not forgotten you, He cares for you. Metropolitan Agafangel, Bishop Ambrose of Methone (Church of the True Orthodox Christians of Greece), and Archbishop George of Moldova reflect on the Synod meeting as well as on the challenges facing Christians in our modern world. The hierarchs emphasise that the Church always has taken a conciliar approach to problems facing the Church. As Orthodox Christians, we believe that the Holy Spirit guided the decisions of the great Ecumenical Councils to define the Orthodox faith. Likewise, the Holy Spirit guides hierarchs today, when they meet personally, with a prayerful and humble attitude. 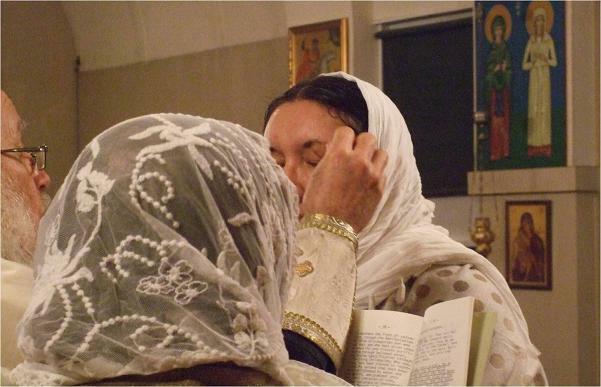 The past Synod meeting concluded that the Church of the True Orthodox Christians of Greece and the Russian Orthodox Church Abroad have oneness of mind and faith. Archbishop George reflects on post-Soviet society, which despite 25 years of availability of more accurate information, has not made full use of these resources. The post-Soviet man is still suffering from spiritual illnesses typical to the Soviet society. In the west, different issues are present. Wherever we live, we must seek healing of the soul from Christ - otherwise we are bound to fall in to many deceptions crafted by the enemy of our salvation. In modern times, many deceptions are promoted in the popular media. A Christian should take measures to guard himself from their influence. It is necessary to limit watching TV and the internet, avoiding all their deceptive and worldly messages. Instead we should go to Church, where in repentance and through personal guidance from our spiritual fathers, we may hope to find the Truth, Who is Christ our God Himself.